I have experience helping others publish their professional papers. I have edited manuscripts and improved their organization and use of language, as well as making sure the references were cited in the proper style. Furthermore, as a reviewer for professional journals in my field (child abuse) I have a sense of what makes a manuscript publishable because, in addition to my own notes to authors, I also get to read other reviewers' notes to the same authors. I will describe to you some of the different kinds of academic articles, the characteristics of a publishable manuscript, how to handle the discussion section, how to turn a dissertation into a publishable article (or two or three), and more. What Kinds of Academic Articles are There? The Survey Paper or Review: This paper provides a summary of work done in a particular aspect of the field during a particular period of time, such as the last decade, or perhaps the last few decades. The purpose of the survey is to point out trends in the field and suggest future directions. The paper may survey laboratory experiments, qualitative research, the environment surrounding the field, such as availability of grants, public support or lack of it, laws, etc. The survey may be critical of what has been happening in the field or may be providing more positive feedback. Survey papers are important additions to the professional literature. The structure of the survey paper is determined by the nature of the topic. Reports on Experiments and Other Forms of Quantitative Research: Empirical studies form a backbone of most scientific or quasi-scientific fields. There are precise methods to follow and the results are analyzed statistically. The paper follows a structure with the following sections: Abstract, Introduction (generally a literature review and statement of goals of the study), Methodology, Results, Conclusions, Discussion, References. Reports on Qualitative Research:While qualitative studies often seek to raise questions and hypotheses that can later be tested in quantitative studies, the method of writing them up for the professional literature is similar to that used in empirical studies. That is, there are the following sections: Abstract, Introduction (literature review and statement of study goals), Methodology, Results, Conclusions, Discussion, References. Position Papers: Position papers are written more freely, not constrained by the format of research reports. The purpose of a position paper is to challenge or support policies, attitudes, behaviours, or some other aspect of a given field. They are generally written by experts with many years of experience upon which their authority rests. For example, I wrote a position paper regarding the approach generally taken by the legal system and social services agencies regarding parents of young people who have committed sexual offenses. This is not a paper I could have written and expected to have accepted for publication ten years ago. Just surfing around, no particular reason to be interested in this topic. I'm wondering if writing an academic article is for me. I need help finding references in the professional literature. I wanted help with the organization of a paper. I want guidelines on writing the introduction to a professional paper. I wanted help writing up the discussion or conclusions. I want to understand the different kinds of academic articles that are published. I want to know how to transform a thesis into publishable articles. I am not a researcher and I am not on any college faculty. Yet, I have published a respectable number of publications in high-quality academic journals and one book. These publications have helped me advance in my field in more than one way. First, the simple fact of deciding on a topic, reading the literature already published on that topic and then organizing my thoughts around what I found and what I observed in my own clinical practice was invaluable - in this autodidactic fashion, I slowly made myself an expert on certain niches within my field of clinical practice. Writing gave me a deeper understanding of the various specific topics I decided to explore and that, in turn, made me a more confident and competent teacher and clinical supervisor. Second, publishing in recognized journals meant that I was more likely to be accepted to present lectures at conferences. This also spurred me on to learn more, understand more, become more of an expert. Third, publishing and presenting at conferences brought more teaching and supervision jobs. It is a wonderful 'vicious' cycle - learning more leads to offers to teach and teaching more leads to increased learning on the part of the teacher. And, finally, it's fun to write and gratifying to see yourself published in a respected professional journal. 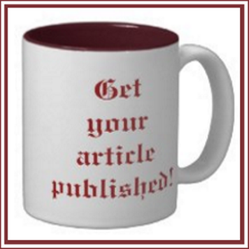 What Makes Your Article Publishable? Is the article written in clear, correct English? It will probably not surprise you to hear that articles written in poor English affect the ability for the reviewer to accurately appraise the value of your work. A few typos here and there, and even some small grammar, syntax or styling errors will not detract from the impression made if the manuscript is interesting and of high quality; however, if the English in general is poorly written, then that reflects on the overall impression. Does the abstract match the content of the article? This point is of utmost importance. In general, the author/s write and rewrite their papers many times. Cut-copy-paste makes it easy to move paragraphs around, to delete and add in new material, as opposed to how the dinosaurs among us remember having to type and retype, editing by hand. The disadvantage of modern computerization is that the author may forget the extent of changes made and leave the abstract in its original form, no longer appropriate to the much-edited material. Abstracts should state the purpose of the article, the methods and results if it is an empirical study or review, the conceptual framework if it is a position paper, and the focus of the discussion section. Are there sufficient subtitles to help the reader understand the organization of the article? Readers are becoming less and less patient with densely written material. Therefore, it is important to break up the page with subtitles; these help your readers focus on important points as their eyes skim the pages. Use the style manual of your particular profession to know how to format titles and subtitles. Today, style manuals can be found online and no longer need to be purchased. Is the methodology appropriate to the aims of the study? It may seem that the design stage and not the writing stage is the proper time to match the methodology to the aims of the study; however, we all know that research does not always turn out as expected. Even when we are writing a position paper or a conceptual exploration, we may find that during the course of our writing our own ideas evolve into something quite different from what they were at the starting point. In a final editing, therefore, check that the description of your methods matches what you actually did. If you changed methods because of developments during the study, it would be helpful to readers to know that. The proper place for discussion of this may be in the "limitations of this study" section of the Discussion. But that depends on the nature of your paper. Does the material follow a logical procession? Sometimes with cut-copy-paste, you lose the flow of the paper. There are two ways to pick up on this before submitting the paper for review: either put the paper away for a week or two and then re-read it, or have colleagues go over it for you. Or both. Are the references cited up-to-date? One of the first things I do when reviewing a paper that has been submitted for publication is check the references list. I want to see that the author is up on the contemporary literature in the field as well as referring to classic works. The former may be more important than the latter in some cases. If you are not on a college faculty, then you may not have access to online journals. That does not preclude the necessity to keep up with current publications. I will describe, in a later section in this article, how to get access to papers that are not freely available on the Internet. Are the conclusions logical and do they stem from the research and/or theoretical presentation of the article? You may be surprised to know that I have reviewed articles submitted for publication in which the conclusions were not consistent with either the results or the theoretical basis of the work. Because the results of empirical studies and sometimes even the results of our own in-depth contemplation lead us to change our minds about some previously held views, we may need to revamp the entire article to ensure that our conclusions are consistent with the introduction and literature review. Changing our minds, revising our opinions, is a sign of open-mindedness and growth. We sometimes learn more from our errors than when we are proven right about something. Could the article be shorter and still get the point across? Longer is not necessarily better. Being able to write concisely and exactly is a skill that is worth cultivating. You should not be writing your manuscript as if you are teaching the subject to novices unless that is its stated purpose, but rather, writing to professionals who keep up with the professional literature. Explain new concepts you are using or recently coined terms, but expect the reader to have a basic grasp of the subject matter. There are text-books and courses for the novice. Your article should aim high. One exception to this rule might be when you are submitting a paper in one subject to a journal that specializes in a different subject. You would do that only when you feel that professionals in another field would benefit from combining ideas from your area of expertise with their own. Should the article be expanded in order to fully discuss the necessary points? While it is important not to be overly verbose, that does not mean scrimping where scrimping harms the quality of your paper. Does the author present a new idea or a unique synthesis of familiar material? This cannot be emphasized enough - your paper must contribute to the development of the field. State very clearly both in the abstract and in the Discussion and Conclusions the nature of your contribution - do you turn some accepted idea on its head? do you add a new perspective for future research or practice? does your work ask a question nobody has asked before? does your work combine fields of expertise in a new way? etc. Is the material relevant to the journal to which it was submitted? Many reviewers will give serious consideration to a manuscript even if they think it would be better published in a different journal. In this case, they may even recommend journals to which the author can submit for consideration for publication. I enjoy helping authors put out their ideas and their research and will make recommendations for revisions even in the case that I suggest the journal not accept the manuscript. Since I use google scholar, I will use this as an example, but other search engines would be as easily accessed. First, type in the URL: www.scholar.google.com. A normal search page will come up but it will be specific for academic articles. Type in the keywords or the author's name, if you have them, or just the subject you are interested in exploring. You will get a page with lists of articles. Just before the articles, there is a strip with three possibilities - articles and patents (I use articles only), anytime (you can specify a year if you want more recent material only), and include citations (I use "at least summaries"). If you want to be more specific in your search, go to advanced search and make your specifications. You now have a list of relevant articles if you defined your topic clearly enough. You can see, on the right-hand side of the title and basic information, that some articles have pdf copies for your immediate access. This is great. But if they do not have a pdf copy, you can write an email to the author and ask for one. Click on the title of the article and a page will open to the journal website in which the article is published. There you will find all the citation information and the abstract as well as an offer to buy the article. Instead, you will write to the author. In some cases, the author's email address appears on this page. If not, see where the author works, google the place of work and find the email address on that website. It involves some detective work, but you can accumulate a well-stocked personal library in this way. It is important in your email to the author to mention the purpose of the request - is it for your own personal writing or research? Because you are not allowed to distribute articles obtained in this way to anyone else, you must tell the author that it is for your own personal use. Copyright laws prohibit distribution to others. The first decision you must make regarding the discussion section is whether or not it is a stand-alone section or a Discussions and Conclusions section. I, personally, prefer to combine them because much of the discussion on the results of the study lead naturally into coming to conclusions. But if this section becomes too large and unwieldy, then consider separating them. The first sentence of the discussion section should restate the purpose of the study and how it was approached. You should then state whether or not the results were as expected or surprising, and clearly and concisely restate the major findings. Next, you compare your results with what is available in the professional literature to which you referred in your Introduction section. Now you can allow yourself more creativity: talk about the implications of your findings, how you hope they will be applied in practice or in further research, making suggestions for future research studies. You also need to discuss the limitations to the study - why are the results not generalizable, for example? What problems arose during the study that impacted upon the results? Do not hide your limitations - be proud of them! This is how one shows one's professional integrity (you do not want to be like the famous psych researcher in Harvard who, at the end of an illustrious career is now shown to have faked some of his data to make them "look better"). It is how one shows one's creativity. Mistakes and failures often lead to the most significant learning. Have fun with the Discussion. When making the first draft of your Discussion section, give yourself free rein to pontificate, to overstate the significance of your work, to dream about where it may lead, etc. You can then put it away for a few weeks, take it out again and pare it down to size, It is easier to delete material later than to think it all up in the first place. You've written your dissertation. You're tired. You don't think you can look at the material even one time more. And at the same time, you want to get your work out there as an academic article or two or three or more. I got one published article from my masters in Agriculture and four from my masters in Marital and Family Therapy. Therefore, both masters and doctoral theses can be publishable. I advise you to do this work yourself and not leave it to your thesis supervisor to write it for you. You need to determine how many articles can come out of your thesis. Can your lit review be expanded enough to be considered a survey or review paper? Do you have different methodologies that lead to unique and interesting results such that each lends itself to development into separate papers? Are there parts of the thesis that are appropriate for one journal and parts for another journal? This would mean that each would constitute a separate paper. A general rule is to keep each paper under 30 pages. Some journals require even fewer. Each paper needs to add something unique to the research literature. In mind at all times should be the question: what am I adding to current knowledge? What makes what I have to say interesting? Do not be afraid to point out limitations in your study or even failures. Sometimes out of failure emerges the most interesting new knowledge. Cut up your thesis into "bite-size pieces" by taking the elements from the Lit Review, Methodology, Results, Conclusions and References list that pertain to each section and putting them into separate documents with titles for each. You now have the skeleton for your new articles. Then thank your lucky stars that you have a computer to work on and don't have to physically cut up and retype the entire thing like we once used to when all we had were typewriters (and we thanked our lucky stars we had typewriters and didn't have to write everything out by hand). Develop these separate documents into publishable manuscripts using my guidelines above. You may want to relate these papers to each other and call them Part I, Part II, etc., or put them out as unrelated papers. First of all , honestly I do find your blog and website very helpful when it comes to technique and tips. These quires that you have mention are really again very helpful. I appreciate you for this post. Thanks so much for saying so, @frankbeswick. It is gratifying to help others succeed. Sheri, this is a first class article that should be of immense use to people who want to write academic articles. Over the years, in my profession, I have published articles in "Adolescence", "The Journal of Feminist Family Therapy", "Sexual and Relationship Therapy", and "The Journal of Child Sexual Abuse", to name a few. Sheri, would you mind mentioning journals in which you managed to publish your articles? You can PM if you want. Yes, @blackspanielgallery - and each profession has it's own word limit. It is important to take note of this when you open the journal directions to the author. In scientific journals brevity is important not just because the audience already has the background, but because there is limited space in any journal.